PARCEL 1- Approx. 32 acres of mostly high wooded sand land, with mature pine trees. ¼ mile frontage on tarred Floodwood River Road to the north, and resort road to the east. Neat A-Frame Home, 20x42- Ft., Two-story with full basement. Two upstairs bedrooms and office, main floor living room facing south with sliding glass doors and deck, center kitchen and north dining area, full bath, and entry porch. On full block basement. Septic system is non-conforming and will be the responsibility of the buyer. Garage is 24x26-Ft. interior lined and has cement floor and tarred driveway. Also includes open-sided building, 16x40-Ft. and a 12x26-Ft. sauna with screened porch building. Buildings are approx. 25 years old. A neat and well-maintained property. PARCEL 2- Outlot A: Approx. 4 acres, with frontage on Floodwood River Rd. and corners on CR 443. And Outlot B: Approx. 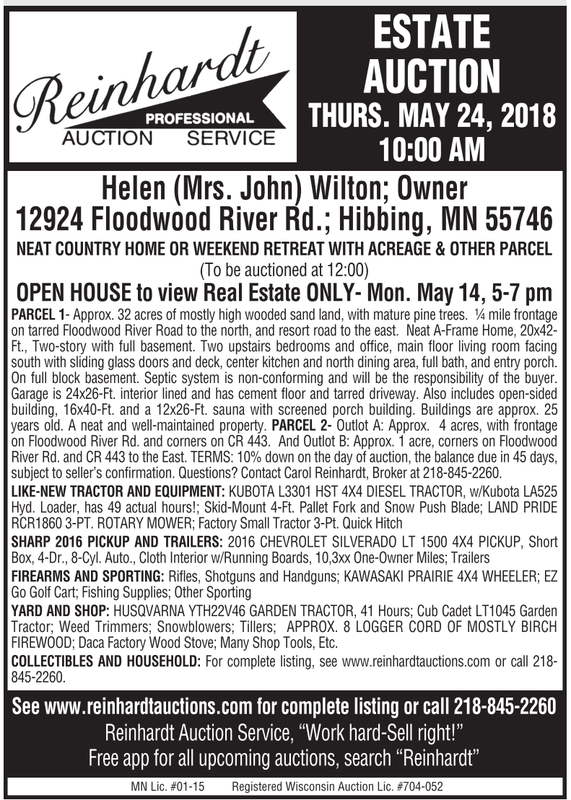 1 acre, corners on Floodwood River Rd. and CR 443 to the East. TERMS: 10% down on the day of auction, the balance due in 45 days, subject to seller’s confirmation. Questions? Contact Carol Reinhardt, Broker at 218-845-2260. LIKE-NEW TRACTOR AND EQUIPMENT: KUBOTA L3301 HST 4X4 DIESEL TRACTOR, w/Kubota LA525 Hyd. Loader, has 49 actual hours! ; Skid-Mount 4-Ft. Pallet Fork and Snow Push Blade; LAND PRIDE RCR1860 3-PT. ROTARY MOWER; Factory Small Tractor 3-Pt. Quick Hitch SHARP 2016 PICKUP AND TRAILERS: 2016 CHEVROLET SILVERADO LT 1500 4X4 PICKUP, Short Box, 4-Dr., 8-Cyl. Auto., Cloth Interior w/Running Boards, 10,3xx One-Owner Miles; Trailers FIREARMS AND SPORTING: Rifles, Shotguns and Handguns; KAWASAKI PRAIRIE 4X4 WHEELER; EZ Go Golf Cart; Fishing Supplies; Other Sporting YARD AND SHOP: HUSQVARNA YTH22V46 GARDEN TRACTOR, 41 Hours; Cub Cadet LT1045 Garden Tractor; Weed Trimmers; Snowblowers; Tillers; APPROX. 8 LOGGER CORD OF MOSTLY BIRCH FIREWOOD; Daca Factory Wood Stove; Many Shop Tools, Etc. COLLECTIBLES AND HOUSEHOLD: For complete listing, see www.reinhardtauctions.com or call 218- 845-2260.